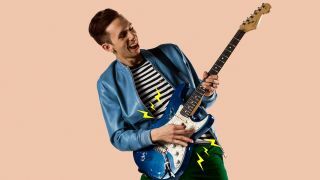 Cory Wong's top 5 tips for guitarists: "What separates the amateurs from the pros is how you find the perfect part for the song"
In many ways, Cory Wong is the Nile Rodgers of the modern age. The Minneapolis-based guitarist has a knack for making rhythm guitar a lead instrument – often saying more with a handful of simple, punchy notes than most technically driven players could ever get close to. “Brixton with Vulfpeck was insane,” he grins, looking ahead to more shows in the UK and Ireland from mid-February, in support of last year’s solo record The Optimist. Just like Nile, there was only ever one kind of guitar destined to be in Cory’s hands – something with enough bite to cut through and enough warmth to sit back, slinky enough to explore the wide dynamic range that comes with playing funk music. “I just have my cheap Highway One Strat and that’s all I need,” he reveals. “I bought it for $300 on Craigslist and then put Seymour Duncan pickups in it. While it’s not the most expensive guitar in the world, it just feels right in my hands... almost like home for me. “I want it to sound almost sound like a DI. I usually ask for any Fender tube amp, though in London I had a Super Reverb alongside a Laney Lionheart, too, because it’s a nice and clean tube amp that sounds big. “I don’t need a ton of pedals, because the majority of what I do is just clean guitar. I have a Wampler Ego Compressor, which is on all the time with all the knobs at noon. I like the thickness and punch it adds to my tone. Then there’s the Vertex Steel String Clean Drive, which is what gives me more of that tube amp feel - a tiny bit of drive but not too much. “No matter how great you think your timing is, it’s probably not good enough. And I say that for myself as well! It’s a constant thing to keep learning. “I think of time as two dimensions: the first is mental awareness and the other is physical education. Today’s musicians have grown up in the grid generation; we’ve listened to more music recorded to the grid than any other generation before us. That’s just how music is made. People might say musical is too mechanical now, too technical and lacking soul, feel and emotion - and though in some cases I feel that’s true - it’s not fair to say that about all modern music. “The grid is just a metric and place for us to have the awareness of how in time we are. Which is totally fine; it doesn’t take the soul or feel from anything if you keep the human nuances in there. If you took some of the greatest drummers in the world and locked them 100% onto the grid, they wouldn’t feel as good or have those human qualities. But an awareness of the grid is important. I practise to the grid so I have the mental awareness of where time fits exactly on. “Then there’s that second dimension: physical execution. Are you hitting exactly on or playing ahead? Where do you actually end up placing your notes? That’s a different skill in your craft, being able to play something behind, on top or right on. Different situations will demand different things. “How do you make your guitar part feel like it’s actually part of the song? Where are the hooks? So many times I’ve seen a jam session that stays on one chord for two minutes and it feels like they’ve been going on for half an hour, and I just want it to end. “Other times I’ll be listening to James Brown or Prince’s bands staying on a chord for 30 minutes and it feels like you could live there forever. That has a lot to do with phrasing and feel, but mainly hooks... that’s what makes it a tangible thing, not just some guy jamming on D minor with nothing to grasp onto. “What separates the amateurs from the pros is how you find the perfect part for the song - something so good that it has to be played every time the song is heard. That’s the difference between the players who blindly make noise to the ones who find where they belong in the song. “Everyone feels time different when they play. I come from Minneapolis, so our timing comes from the whole Prince thing which is locked onto the centre of the grid. He’s one of my favourite lead players of all-time - everyone needs to watch that Rock And Roll Hall Of Fame jam he did with Tom Petty, Steve Winwood and Jeff Lynne, ripping all over While My Guitar Gently Weeps - but his rhythm guitar comping was just as insane. “As well as you think you know the pentatonic scale and major scale, there are permutations out there that will make you feel like you don’t know what you’re doing at all and get you lost. Rather than being discouraged by that, look at it as a fun thing - there’s a lot more mileage in the pentatonic and major scales than you ever imagined. “Practise both in a way that hones in on two- or three-note intervallic ‘pods’. For example, going up in 3rds, like 1, 3, 2, 4, 3, 5, 4, 6, 5, 7 and so on. Then try the same in 4ths, 5ths, 6ths and 7ths. Or up a third, down a third the whole way – or up, up, down as well as down, down, up. There are so many permutations out there. “Take that exact same concept and play two notes at a time as chords, going up in 3rds on two strings at a time. Harmonising your scales up and down the neck with just two notes will give you such a different perspective of the scale and how the guitar is laid out under your fingers. “If you are honest with yourself and stick to learning them, it will give you a lot more freedom later when you want to play lines and improvise or write. “People tend to separate chordal stuff from the melodic lines, but they’re actually part of the same thing. I look at it more like the CAGED system. Look at it from a chordal standpoint as well as arpeggios. “I’m a huge arpeggio guy, I learned all the Larry Carlton stuff where he takes groups of triads to outline chords. The dude is a genius, and I’d say him and George Benson are my two favourite soloists. “Once you’ve really honed in on that CAGED system, you’ll have a lot to work with. Look at a G chord and take it through the wringer, learning all the arpeggios in all five shapes. That will leave you with five chords, five arpeggios, five pentatonic shapes and the major scale notes. “Dive into these shapes and explore from there. After that, the bonus/advanced work would be to fill in chromatically between those tones within any given shape. “If I look at the E minor pentatonic that everyone knows, two notes per string, I might try to fill in all the notes in between your first and third/fourth fingers. That gives a different type of melodic line with outside notes, so try to think of your pentatonic notes as your landing points or target notes and the chromaticism as in-between notes. Cory Wong tours the UK and Ireland in February/March 2019, beginning on 20 February in Limerick. Head over to corywong.com for full dates.